At Mountain Kingdoms we have a real passion for travel and we're constantly seeking out new destinations and experiences in the far flung corners of the world. But each member of the team has somewhere that they're totally smitten with - a special place that soothes the soul and lifts the spirits. Here are just a few of our travel love affairs. I have travelled to Nepal at least a dozen times - trekking, cycling and climbing giant peaks. But the two places that remain my favourites are Dolpo, near the Tibetan border, and the base camps of Kangchenjunga. They both have the most incredible Himalayan scenery and are long, strenuous, satisfying treks. Just my thing! Approaching the Ghami La, 5,700m, in snow, following the tracks of a snow leopard was a particularly fond memory. Wild Nepal has definitely stolen my heart. I’ve been lucky enough to travel the world and been to so many amazing places but the country that I have the greatest passion for is Bhutan which I’ve visited over 7 times now. There are many unique things about Bhutan – the national dress, dzongs, Gross National Happiness, the architecture and the food (chili cheese anyone!) but for me it’s the completely unspoilt nature of the high mountains that make it so very special. It’s one of the few places that you can find real wilderness and enjoy a ‘proper’ camping trek, immersed in the spectacular scenery and completely removed from the modern world. The Lingshi Laya Trek is probably the nearest I’ve come to finding my trekking Nirvana. It’s a close run thing, but Kerala in Southern India just beats Nepal to be my top travel destination. I first went to Kerala in 2008 and have now been three times in total. I love the warm winter sun, the amazing food, the vibrant colours, the gorgeous tea estate landscapes, the unusual and stylish accommodation and the smiling friendly locals. What more can you ask for? My favourite memory though is watching the sun set over the backwaters with the local fishermen paddling out in their small boats for the night. Kerala is just idyllic and the ideal choice for a romantic holiday. My travel heart belongs to the national parks of Arizona and Utah in the Southwest of the United States. I’ve returned many times since first visiting back in 1997 and can never get enough of those sculpted red-rock landscapes, vast blue skies and iconic sights that somehow make you feel you’re starring in your very own western movie. The Grand Canyon is undoubtedly the biggest star of the show, but there are numerous supporting actors in the fabulous cast of national parks: Bryce, Zion, Arches, Canyonlands and Monument Valley are just a few of my Oscar winners. And I'm hoping to go back soon to present my awards! My greatest love (apart from my family) is the mountain of Gangkar Punsum. The highest unclimbed mountain in the world and the highest mountain in Bhutan. I first went there in 1986 when, by a series of extraordinary coincidences, I managed to secure a permit to attempt the first ascent. My friends and I reached very high on the south west ridge before she became angry at our audacity and summoned a storm to blow us off the mountain. I have been back six times since then exploring the valleys and the satellite peaks. Just to be in her presence is to be dumbstruck by her beauty. She allows my admiration from afar but will remain forever inviolate to my touch. I visited in October 2016 and was totally captivated. I found Cambodia such a fascinating country and particularly loved the bustling markets, floating villages and the lovely countryside. The Cambodian people were so friendly and welcoming - we even visited a village school where we got to talk to the children and find out more about each other, it's a really special memory of the country. Oh, and not forgetting the tempting Khmer curries and sweet coffee - another very good reason to return! When I travelled to Zambia two years ago, it was the first time I'd done a walking safari and what an incredible experience it was. 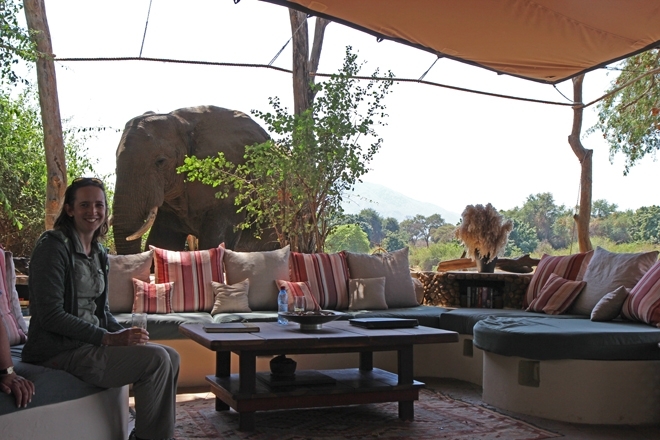 The indulgent bush camps, the lovey staff and guides and, of course, the amazing wildlife encounters - it was love at first sight, especially with the curious elephants who came into the camps. It's hard to pick a single, special moment though as there were so many, but my absolutely favourite time of the day was at sundown - sipping a G&T, watching the sunset and listening to the mesmerising calls of the wild. A little bit of heaven on earth. 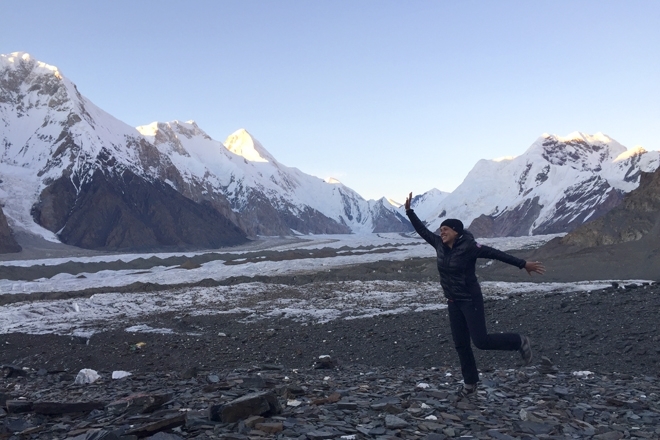 I was fortunate enough to travel to Kyrgyzstan last year on our South Inylchek Glacier to Khan Tengri trek. I knew it would be a fantastic experience but I didn't realise that I was going to fall in love with the heavenly Tien Shan mountains. Every day brought breathtaking views as we trekked along the glacial valley to the base camp of South Inylchek flanked by immense peaks on every side. But best of all was the thrilling helicopter ride back down to Issyk Kul Lake - stop my beating heart. One of my happiest travel memories was the morning that I made it to the summit of Mount Kilimanjaro in Tanzania. It wasn't just the incredible sense of achievement and awesome sunrise views that made me feel so good, it was also because I was following in the footsteps of my grandfather who climbed Kilimanjaro in 1955 as part of an army expedition. He's very proud that I made it all the way to the top.